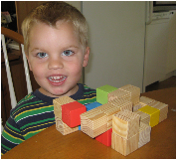 A young mother sent in pictures of her three-year old son Malachi and his Soma cube. Would an ice cream cone elicit any prettier smile? Fitting the Soma pieces together is much more challenging than stacking the single cubes of a traditional set of blocks. Since each Soma piece is different in shape, they fit together in different ways. Making a cube from the seven pieces isn’t an important task for Malachi. Simply fitting the pieces into any shape exercises his ability to think about three-dimensional space and how the pieces fill that space. 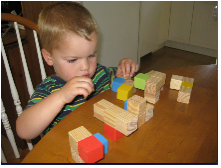 In his exploring, Malachi may even fit two or more pieces together and build a structure where its parts are physically separated. For Malachi, or any other youngster, it’s not about what’s right or what’s wrong, or getting “solutions”, it’s about the simplicity of the materials, and the structures that young minds can create to meet their needs. Shhhh! Don’t break Malachi’s concentration. He’s about to make an important move. Let’s all do the best we can to provide our kids and grandkids a rich learning environment full of interesting objects and useful tools. Thank you mom for taking the time to send Malachi’s photos to grandadscience.